Just a quick note to let you know Hallie is doing fine. We had to retire her from competitive competitions in agility as we are moving to our new home on the water front on our island. Her new job is keeping the geese off the beach front, which she seems to enjoy. We added Bob a rescue English Bull Dog and is hard to go anywhere with out them being the center of attention, which they just love. Not sure who is having more fun the dogs or the grandkids. Hard to believe she will be 5 this fall. Just about a year ago we lost our dear pitbull mix and were devastated. After a few months, we decided it was time to think about a new baby for our family. 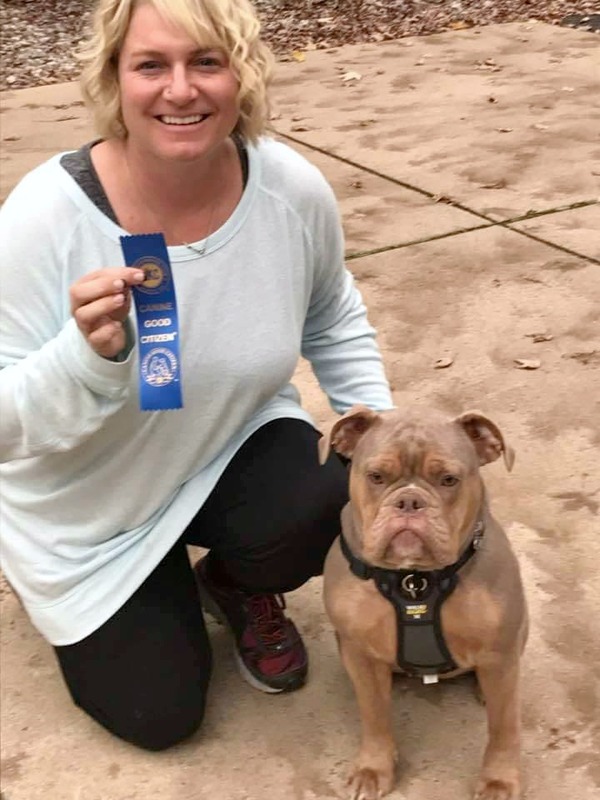 My husband and daughter did extensive research about the English Bulldog breed vs. the Olde English Bulldogge breed and we knew the OEB was for us. We also did much research online about a good breeder in our state and we found Don and Amy Barton. THEY ARE AMAZING!!!! Their breeding of Oldes is not a “for profit” investment but an investment of love for their dogs and total commitment to the breed. We feel like we found family we didn’t know we had when we got to know them. We just brought home our little guy, Tiberius Mack, this past Friday and we are crazy in love with him. He is so good, so well-adjusted (because he wasn’t confined to a kennel as so many breeders do, but lived and constantly interacted with the Bartons) and he is so smart. We have already recommended Don and Amy to others and will continue to do so. They have been a God-send to us and we love them. We are excited to watch Tiberius grow and know that in the future, we will be adding more OEB’s to our family and Don and Amy will be our “go-to” when the time comes. Thanks so much, Don and Amy, for all you do and for making us feel so welcomed into the OEB family. We fell in love with the Olde English Bulldogge breed when we got our first one five years ago. I researched breeders for several months looking for our next puppy. More than 2 years ago I reached out to Don and Amy as I was impressed by their breeding methods and their male and female dogs that make up their program, specifically Spartacus. I waited patiently for the right breeding while staying in contact with Don and Amy along the way. Just this past weekend Don took the time to deliver our baby boy Gotti from the Spartacus/Lexi litter, and we could not be more happier and in love with our little boy. We had the pleasure of meeting Don and Amy as they opened their home to us to pick out our puppy. They are very honest and trustworthy people. They are truly running this program for the love of the breed and to bring happiness to others! Thank you Don and Amy for Gotti and all the guidance you provided us. Three years ago we lost our beloved Ruby to cancer. It really took a long time for us to decide we were ready for another dog. 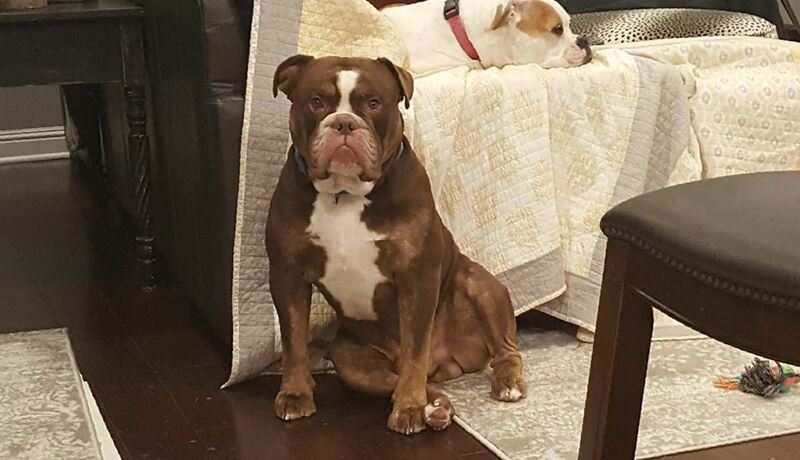 My husband had always wanted a Bulldogge but I wasn’t so sure. We found Don and Amy on their website, so I called them. After talking to Don I knew this was the breed for us and they were the breeders for us too!! I can’t say enough about how great this experience has been for our family!! Don and Amy truly care about the puppies and their new families. They want us to succeed at being puppy parents and encourage you to contact them for any help/questions you have, Amazing!! Thank you Don & Amy we love Molly & Harley Quinn so much!!! We have known Don and Amy for about 4 years now. We had Dozer, at the time 6 year old Olde English. We were looking for a partner for him. We ended up waiting through a couple litters for just the right pup for us. Don and Amy kept in touch through the whole process and made us feel confident in our puppy Lola, now 3 years old. We lost our boy Dozer in December. It was devastating. Don and Amy were the first people I contacted when I knew I needed another male. They listened and knew exactly what I needed. Also, they knew that I have an 11 month old daughter and baby on the way. They picked our boy Mack for us. He is a very special puppy. Beautiful inside and out and the perfect match for our family. I can’t thank them enough for Helping our hearts heal and completing our family again. Also, I am very specific on what I require from a breeder. I have volunteered, grown up with show dogs, and am anti back yard breeders and pet shops(puppy mills). Don and Amy take amazing care of their dogs, do not over breed, and give their dogs a great quiltiy of life. They get to run on acres of land and live inside. The dogs are their priority and they are wonderful warm caring people with the dogs best interest. I strongly recommend them!!!! Don and Amy are awesome breeders. Buying Leonidas was and honor and a privilege. Leonidas is an awesome bulldogge. A fine example of excellence I couldnt ask for better people to buy a fur kid off of. I’m proud to call them friends for life and look forward to someday having another Mighty Michigan Bulldogge. Where do I begin?… We lost our beloved Mavi after 14 beautiful memory filled years. He was the first furkid my husband & I were blessed to share our lives with. We still had our other furkids: McKinzee (14yr) Cocker Spaniel ~ Rocco (9yr) Rottweiler ~ Shadow (7yr) Blk Lab/Pit ~ Tango (6yr) Orange Tabby & Cash (7yr) Blue Tabby. Yes – we still had a house full of furkids – Yet since the day we said farewell to our dear Mavi there was just a void in all of our hearts! After almost a year the void was still very much present my husband began to consider the idea of adding a new addition to our fur family. Though hesitant we both grew more hopeful as we both began to consider this step forward. While searching the internet one night he happened across Mighty Michigan Bulldogges website & little did we know in that instant the amazing journey we were both about to embark! After some email exchanges between my husband & Don my husband began to consider putting our deposit in for a future litter. Lexi & Spartacus puppies were only a couple weeks old & there were still 3 males available. We knew we desired a male but were still not sure we were ready to jump quite yet. For the next few weeks we watched the puppies grow via pictures & decided to make the trip to meet these adorable bundles of pure joy & Don & Amy of course! Don & Amy welcomed us into their homes with open arms! We immediately saw how they commit 150% of themselves to their own furkids as well as all the beautiful fur babies they help bring into this world. We went on to meet the puppies 1 x 1 – we knew that it was still a bit early as they were only 5wks old & there were others yet to make their choices before we would know for sure which male pups were even an option; so we did our very best to keep an open mind & not get our hearts set on any specific puppy just yet. We held a couple males we had our eye on & met momma Lexi & then it happened! We met our Leonidas! My husband picked him up & he immediately stole both our hearts – he looked at me & gestured himself towards me as if asking me to hold him – so I gladly obliged – I then placed him back in with his 10 brothers & sisters. Within seconds he looked at my husband & I & began to whimper followed by walking over to the side of the gate & scratching at it till my husband picked him back up. These actions continued to repeat themselves 3-4 times over the next 30 mins as it became undeniably clear our Leonidas had picked us….Though in our hearts we knew there was still the chance he may not be ours. We went on to visit with Don & Amy for a while longer before saying our farewell & heading home for the wait. I will never ever forget the moment we got the call from Don telling us that Leonidas was ours if we were ready & wanted him! I was instantly in tears of joy! I know in my heart our paths were mapped long before we ever knew & are so beyond thankful for Don & Amy – for if it were not for them & their commitment to OEB breed we would not have our precious Leonidas! Thank you so very much Don & Amy for all you do & the blessings you bring to so many & especially the joy you have brought me & my family! It’s hard to find the words to explain how amazing Don and Amy are. The hard work and commitment they put into their breeding program is truly amazing. Fidel and I lost our two American Bulldogs to cancer about a year and a half ago. They were our first “children” and we were completely crushed by the loss. But our house just felt empty without the sound of little nails trotting across the wood floor. So we set out to find a new fur baby for our family. I’ve been in love with the bull breeds since I was a kid and I can’t really shake that. But we were hoping to find a dog that is a little smaller than our Americans but still active and healthy. We contacted several of the top Olde English breeders and got responses, but nothing like the response from Don and Amy. Don got on the phone with me and spent over 2 hours chatting about his dogs and his program and I was blown away by his passion! I had a lot of questions about the dogs and the breed in general. Our hope is to train a bulldog to be an autism service dog for our nine year old daughter. So a rock solid temperament would need to be top priority. Several other breeders that I reached out to really emphasized color and markings. And, although Don and Amy’s dogs are some of the most consistantly correct and stunning I’ve seen, I needed a dog I could count on as well. Don answered all my questions and I was pretty confident with his experience and knowledge. We live in California, so buying a pup all the way in Michigan felt scary. We would have to really trust Don and Amy. It’s hard to see personality and temperament through pictures. I think I probably drove Amy crazy with all my messaging! From the minute the pups were born, I was asking her which ones were shy and which ones were assertive. lol. She had to keep reassuring me that their personalities were still developing and they would do their best to find a good fit for us. And they really did. We really couldn’t be any happier with our pup, Joni. She’s everything we dreamed of. She’s only 18 weeks but so far her temperament is amazing. It’s hard for us to go out in public because she has such a fan club! We’re looking forward to starting our training this summer. We were blown away by the commitment from Don and Amy as well. I really don’t know any other breeder that would hand deliver a pup from across the country. It really meant a lot to us that they would take a week out of their life to drive out for us. And it really says a lot about the way they are caring for their dogs. This isn’t a back yard breeder situation. Don and Amy will forever have a special place in our hearts! Thank you for everything! Approximately half a year ago, I started thinking that my Olde English Bulldog Uma needs a brother. After a long, thorough and careful research, I found Mighty Michigan Bulldogges. We didn’t mind to wait for the perfect puppy, and finally baby Phillip joined our family. He is of exceptional quality, smart, sweet, healthy, fast growing boy. If you ask me, he is growing a little bit too fast even =) Not only Don and Amy provided us with this ball of joy, they helped me to learn so much about this wonderful breed. I received many tips and tricks from them about training, growing Olde English Bulldogs. I am very happy that I became a member of the Mighty Michigan Bulldogges family! Thank you so much Don and Amy! So in January of 2016 my husband found Don and Amy from their website after researching many breeders. We decided to call them and talk to them about a puppy. We knew that we wanted Sascha to be our mommy just from their website. We knew that it was a long shot that next breeding would be Sascha, but we were ok since our daughters had been told once our 3 year old goes to Kindergarten then we would get a puppy. Little did we know that Don and Amy were planning on breeding Sascha next with Ice! We were so excited and so were our daughters knowing that their puppy would come sooner than later! In March we took a road trip to visit Don and Amy to make sure my allergies would be ok with this breed and meet all the dogs. Well I was fine and Don and Amy spent 3 hours with us talking and introducing us to all of the dogs and puppies they had. We feel in love with Sascha and she took right away to our daughters and we knew that she was the one. Also once we saw a picture of Ice we knew it was a perfect match for our family. Then in June 2016 we had some sad news of Sascha’s pregnancy not taking. After talking with Don and Amy about other breedings they were doing and talking as a family on what we wanted to do. My 8 year old said she only wanted Sascha’s puppy! So we would wait and say some extra’s prayers for her. Then on December 8th Don texted and said can I call you. He had the wonderful news that Sascha was pregnant! Don and Amy called that night to share the news with our daughters everyone was so happy. On January 16, 2017 our Bertha Rose was born! During the whole process Don and Amy kept us in the loop and answered all of our questions, from all of us! They sent a picture at 3 AM (I asked for that) to make sure we were a part of this whole process. We could not of asked for better breeders/friends. March 11th our family became complete! Don and Amy brought Bertha to us! Don and Amy are truly the BEST breeders around. You can see their love for each of the puppies they bring into the world. They are there for us anytime we have a question or just want to share a funny story or picture of Bertha. Bertha Rose. Words cannot express how thankful we are for her and both of you! I just needed to write to share what truly amazing, caring, loving people and breeders Don and Amy are. The amount of time and energy and love they put it into all their dogs, throughout their lives, even when they have gone off to their forever homes is unbelievable. I do not know of ANY breeder that cares as much about the health and well-being of all of their produced dogs. 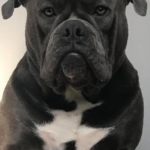 I have been through hell and back with an ex that had taken my olde english bulldogge, Agnes, that I had gotten from a Harley X Mercedes litter. Don and Amy were right there with me through hours of phone calls, emails, texts. They worried and prayed with me. They couldn’t have been more helpful and supportive – making phone calls themselves and writing a letter for my court hearing and offering to drive all the way from Michigan to Florida to testify. After 5 agonizing months of legal proceedings, my nightmare was over, and my Agnes was returned to me by order of the court. I am in the process of getting her back to optimum health, as my ex didn’t care for her well. It was the hardest thing I’ve had to go through in my life, and mere words aren’t enough to express my gratitude to Don and Amy for their support and caring and love for Agnes and all their help and insights into fighting this battle. I don’t know if I would have gotten my daughter back without all their help. Words aren’t enough for what they have done for me and for Agnes. What they say is not just b.s. to sell dogs. These 2 people LOVE AND CARE about their dogs, and their actions speak so loudly that you don’t even need the words. They are truly amazing people, and they will be there for any of you through ANY difficult circumstances with your dogs. You are truly part of their family, and as part of their family they will do their best to fight for you and your dog and with you and your dog. God Bless you both. I have my beautiful girl back, and I couldn’t have done it without you! Words can’t say enough. Thank you and much much love!! After losing our last dog after 15 wonderful years, it was hard to contemplate the idea of a new puppy. 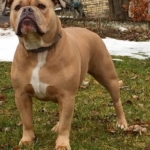 My husband has always wanted an Old English Bulldogge and found Mighty Michigan online. One phone call to Don and we were hooked. Don and Amy have been wonderful to work with – spending time answering all our questions and guiding us as we contemplated TWO puppies. Cheoah & Grayson are the most beautiful, loving, active, and inquisitive pups. They are structurally sound with high recommendations from our vet. They have such interesting & diverse personalities and are so much fun. We can’t thank Don & Amy enough for helping us bring so much joy into our lives. We are so grateful in being a part of the Mighty Michigan Bulldogges family and appreciate the continued support from Don & Amy through puppy mischief. We picked up our fur baby, Walter, from Mighty Michigan Bulldogges about 2 weeks ago from the Sparticus/Mercedes litter, and he has far exceeded our expectations! We were amazed when we saw him for the first time! He gets cuter everyday and has the best personality! Don and Amy are so awesome! We highly recommend choosing their puppies! They take their breedings so seriously; they promote healthy dogs with good genetics and are there for support if you have any questions or emergencies. It is really nice that they go the extra mile! We are so grateful to have this new wonderful puppy in our lives, and to have met such amazing people as Don and Amy. Thank you so much Don and Amy for your hard work, time, patience, and understanding; you’re the best! Just took delivery from Don on the sweetest little girl from Sparticus and Mercedes litter. We named her Josey and are absolutely in love with her. Don and Amy take great pride in the integrity of their pups and that really shows in the results. This little girl already is showing us her great personality and looks like she is going to be very playful. This is our third bulldog but first Olde English, after doing a ton of research on breeders I felt most comfortable with Don and Amy. Looking forward to a number of great years with our newest member of our family. Ich bin einfach fasziniert von so vielen wundervollen Nachzuchten. Ich wünsche ihnen weiterhin viel Freude und Erfolg in der Bullyzucht und sende ihnen einen lieben Gruß aus Deutschland. I am just fascinated by such wonderful breeds. I wish them a lot of joy and success in the Bullyzucht and send them a GREAT greeting from Germany. I bought one of Mighty Michigan Bulldogge’s from the Sascha xOscar litter. I couldn’t be happier with my pup. She is smart, kind, good natured and very athletic, healthy and gorgeous. Don & Amy are amazing people. They have genuine love for these dogs and they are very serious about providing the best to their customers. I would highly reccomend Mighty Michigan Bulldogge’s to anyone out there looking for a top quality pup. You won’t be sorry. I hope to own another one someday. We’ve had our puppy from MMB for about 6 weeks now and couldn’t be happier. He’s handsome, smart, athletic and quite the crowd pleaser. Don and Amy were terrific people to work with and we highly recommend one of their dogs to anyone that may be interested. After visiting multiple OEB breeders I met with Don and Amy and found that there was a clear distinction between Mighty Michigan Bulldogges and the ‘rest of the pack.’ Don and Amy are clearly passionate about their breeding program, which is evident based on the high quality of the dogs in their program. I was extremely impressed with their knowledge of breeding, their own OEB’s, high standards, and their overall enthusiasm. They went out of their way to share as much knowledge as possible and help me make the right decision. When I went to visit them, and ultimately picked out my puppy, I am confident that I could have closed my eyes, picked one at random, and been equally satisfied with any of the ten pups. I have only had my puppy for a week but I can already tell that I made the right choice based on her calm / submissive energy and her disposition with other people / dogs. I have already had multiple people tell me that she should be the Cleveland Browns’ mascot. I am incredibly happy with my decision to purchase a dog from MMB and I can’t wait to see how well my dog continues to develop. 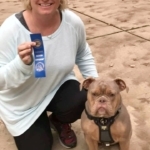 We have 2 fur babies from Mighty Michigan Bulldogges, not only are they the best pets and family members, they have been bred to be the highest quality, intelligent, mild mannered and loving pets. Don and Amy are not just breeders, they have become friends. They are very knowledgeable about the breed and are very helpful when it comes to answering any questions or concerns that anyone may have, and they offer one of a kind service, and a lifetime of support. Don and Amy truly are one of a kind !! We are extremely honored to be a part of the Mighty Michigan Family!!! We are so happy to have become a part of your family and you ours, everything you said about these wonderful dogs was true and right on the money. In this day and age it is refreshing to meet people with honor and integrity. Our little boy Tank has been such a blessing to our family and to everyone he comes in contact with. Since his first week home little Tank has accompanied me to the hospital for my treatments and he basically took the place over. He is five months old now and is well on his way to becoming a therapy dog. We had no intentions of raising a therapy dog but he took to it like a fish to water, so no greater testimony can be given regarding disposition. The peace and joy he has brought to people with illness has been amazing to watch and a true blessing. These dogs are truly unique and Don & Amy’s dedication is evident in all of the dogs. Thank you for bringing little Tank into our family and may God Bless you and all of the wonderful dogs in Bulldog heaven – that’s what we call MMB! We got our first dog from MMB, and she’s simply the best dog we’ve ever had! So, when we decided she needed a play-mate, we, of course, came back to MMB. Their olde english bulldogges are exactly the look we like. Don and Amy have been so great and understanding, while we’ve gone through the process of finding the right companion for our current dog. They have been great answering questions and helping us through the process. 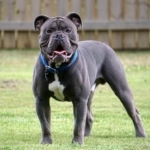 We now have the perfect male dog (wonderful, sweet tempered, intelligent with amazing structure) to go with our perfect and beautiful and entertaining and confidant female oldie. They are a perfect match. We were amazed at how great they immediately got along. We couldn’t ask for better, more loving dogs. Thank you so much Don and Amy for our perfect children. They are the loves of our lives!! We are thrilled with our new puppy from Mighty Michigan Bulldogges! Being a small animal veterinarian, I am always looking for a healthy pup first and foremost. We have never bought a dog from a breeder before but our family really wanted an Olde English Bulldogge and I couldn’t be happier with the health and quality of our new pup! Thank you Don and Amy! In short order our Triple Crown Benelli (Nelli) fell in with our family and captured our hearts. Our vet was impressed with her at our “new baby” visit. Don and Amy make a great team. Their gee/haw works flawlessly! The foundation for their successful breeding program is the love for and dedication to their dogs. They are ethical breeders that continually strive to improve the breed. They offer their puppy buyers a lifetime of support which in a word is…invaluable. Uncle Oz Bulldogges is thrilled to be a part of the Mighty Michigan family! I cant say with enough emphasis that MMB is THE BEST. 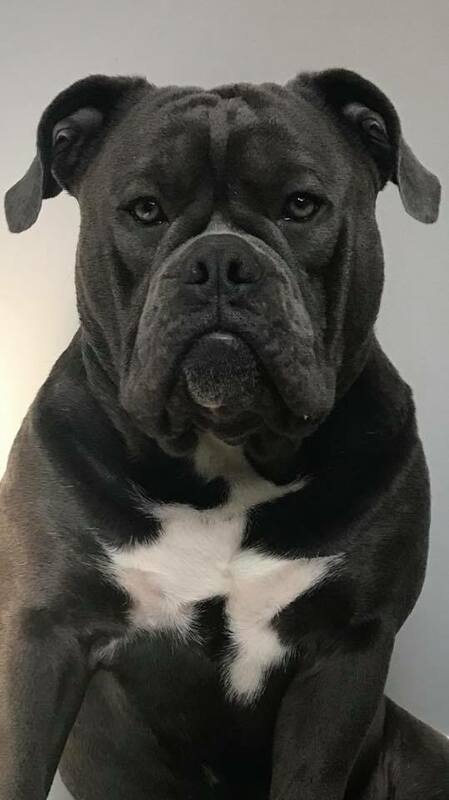 We purchased our first puppy from Don and AMY 2 years ago and I said back then that I would not get a bulldogge or any other dog from anyone else. There simply aren’t any breeders that I have come across who care about the OWNERS just as much as they care about their dogges. MMB produces healthy, athletic, mild mannered and LOVING pets…PERIOD. These dogges are rare but Don and Amy are ONE OF A KIND!!!! Love you guys. Keep doing what you do. When we started looking for an Olde English, we called a few breeders in Minnesota. They were not very informative or offered a lot of information. We continued looking and found Mighty Michigan’s. We live in Minnesota so we thought let’s call and get details since the dogs are SO CUTE but they live far away so this is a maybe. Don answered and spent a lot of time going over details and information about the dogs, the values of their breeding program, and answered all questions. Even questions I didn’t think about, Don came up with. After the conversation with him, we felt good about putting a deposit down on a puppy, even if they were located 14 hours away. Throughout the process, Don and Amy were very informative and kept us updated. When they say we are here for you 24/7 for any questions or concerns, they really are. They always answer their phone and respond to any emails or FB messages right away. We feel like we were/are well taken care of. So much that we decided to get two! Both are so outgoing, friendly, and well socialized. I cannot say enough about how great of an experienced we had and continue to have! Our puppies are adorable, healthy, and happy! 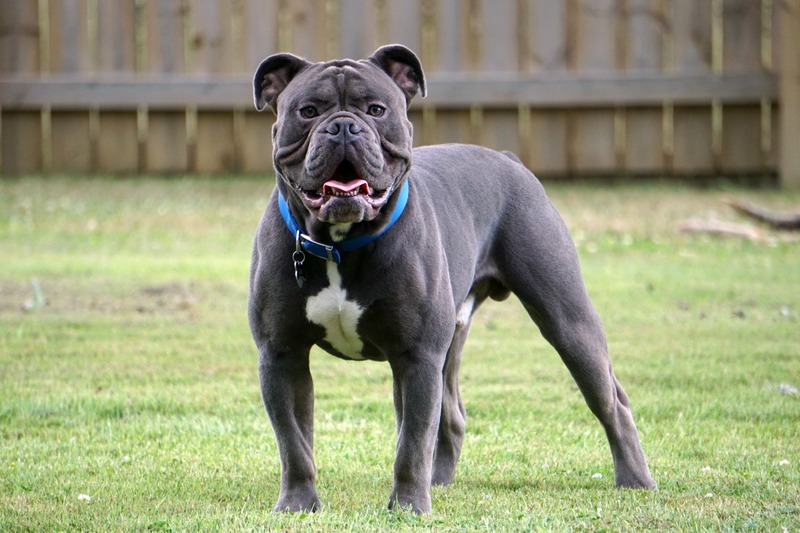 My soon to be wife and I researched dog breeds for well over a year before deciding an Olde English Bulldogge was the perfect dog for our lifestyle. After that we began speaking to breeders, every breeder near us. Don and Amy were the first my fiancee called and she had nothing but good things to say. Me, being the researcher I am, spoke to several other breeders prior to talking to Don. The other breeders provided basic information but Don spoke straight to my heart. That might be odd to say, but our puppy Kaline (of Harley and Mercedes decent) has captured our hearts since day one. Any concerns we had, and we had quite a few, both Don and Amy not only addressed, but comforted us. Don and Amy are wonderful people and their dogs are beyond beautiful and smart. Kaline quickly assimilated herself to our home and understood “potty training” within 2 weeks in the dead of a Michigan winter. It is outstanding how quickly Kaline learns commands and how eager she is to please. I have had several show quality German Shepherd’s in my life but haven’t ever seen a dog so eager to learn. I cannot say enough about how smart these dogs are. In addition to the smarts, the looks of the dog are show stopping – every time we take Kaline for a walk it is the equivalent of driving an exotic sports car through a neighborhood. Everyone stops and asks questions about her! My fiancee was concerned the Olde English Bulldogge breed wouldn’t be as loving as she desired but boy was she wrong, Kay loves to spend every minute with us and is extremely affectionate. Ultimately, we could not be happier with our choice – in both breeder and dog – and plan to add to the family in the next two years with another Mighty Michigan Bulldogge. Thanks Don and Amy for all that you do! For reference Kaline is nearly 5 months old and nearly the best thing in this world. I could not recommend Mighty Michigan more! I had the pleasure of visiting with Don & Amy about their puppies and lots of questions about this breed. What gorgeous animals and people who have a heart and love this breed. Very impressed. I had been searching for the perfect dog that would fit our needs and lifestyle perfectly for many months. I did a TON of research on various breeds, and through exhaustive research I found the Olde English Bulldogge breed. Then, the search became the perfect breeder. Again exhaustive research. I don’t know how many breeders I researched, but every single one I could find throughout the United States. If I was investing into a pet that would be part of our lives for over a decade I wanted to find the absolute best possible. After my endless hours of research and comparing breeders and programs, I felt absolutely confidant in choosing Mighty Michigan Bulldogges, and I do not regret that decision for one second. Their dogs are, in my opinion, by far the most absolutely beautiful OEBs. Don and Amy have been amazing. Answering our EVERY question about their program and about our dog, Agnes, who is from the Harley and Mercedes breeding. It has been wonderful to truly feel apart of an OEB family with all the other people who have also selected Mighty Michigan Bulldogges. I couldn’t ask for a better support system, and we ABSOLUTELY ADORE and LOVE our bulldogge, Agnes. Her coloring, coat, temperament and structure are spectacular. We proudly and confidently refer everyone who inquires where they can get a dog like ours to Mighty Michigan Bulldogges. We are excited to bring another puppy home soon from them. For us, there isn’t a better OEB breeder or program! Don and his wife were honest and willing to answer all concerns. We got a male from Harley and Mercedes. We have a road to travel with him as he is going to be my service dog – as far as temperament, structure, and smart. Best of all he has a drive to learn and retain training. This will challenge his resolve and be great for the breed. So I will keep updating. This is all due to the thought that Don and Amy put into their program. Thanks MMB! When the time is right we will hope to get a female . We love our pup. He is all bulldogge and will be a great addition to the family. Don and Amy were great to work with and really care about the breed and what they do. I would recommend them to anyone looking for a new family addition. FINALLY! I have found the perfect breeder who put the well being of their furry family first! Will be contacting you you soon! 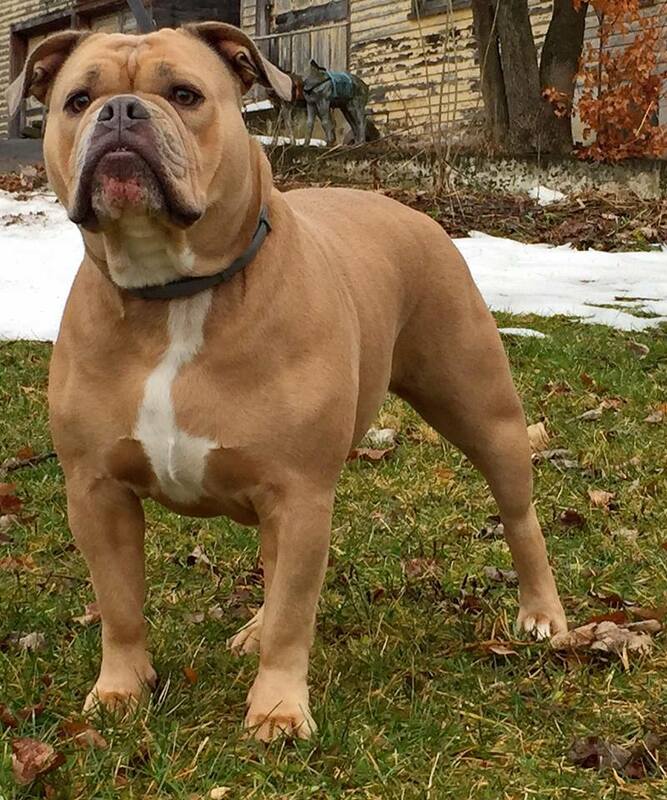 Mighty Michigan Bulldogges are stunning! We have three young kids and were looking for a good family dog that could keep up with a good spirit. These dogs not only are beautiful, but have amazing temperament as well. We received a pup from the Diesel and Maddie litter and could not be happier. He is so loving and gentle with the kids. He jumped right in and seems to have always been apart of the family! We have had the pleasure of meeting some of Mighty Michigan’s adult dogs and they are all this way. Beautiful, healthy, and good-natured! Very pleased. I don’t even know where to start. There are so many wonderful things about this breeding program! I am the type of person who does an extensive amount of research before I do anything. I researched Bulldogges and breeding programs for several, several months. I must have went through 35 pages of Google and looked through each breeding program with a fine tooth comb. I am critical, meticulous, and a bit of a perfectionist lol. Despite of those characteristics, Mighty Michigan exceeded all of my expectations. They set a whole new standard for beauty and power in their breeding program. Their dogs are truly second to none. I can say that with the utmost confidence because I have studied hundreds of dogs across the country for a long time now. Not only are their dogs top notch, they are even more amazing as individuals. Their character is impeccable and they are true to their every word. There are so many more amazing, wonderful, and over the top qualities about Don and Amy and their program, but what I cherish and admire most about them is how I know I can put my trust in their hands and they will deliver what they promise. 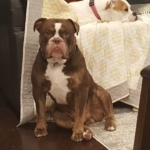 If you are looking for a beautiful bulldogge, look no further, this is your place! Hey there, I’m the proud daddy of Oliver who was sired by Spartacus and All Juiced Up’s Jam last fall. I really love what you and Jen are doing with the breed. I’ll be looking to another similar pairing for my next dogge in a few years. have a pup from Diesel….he looks MARVILOUS! Don and Amy are amazing. They were beyond wonderful from the first discussion we had about our future puppy, throughout Maddies pregnancy, and still are! They were most helpful in the beginning when we brought our puppy home and a LOT of questions. I respect these two so much. I am so thankful for all of there help and encouragement. I wish we lived closer so we could visit often!! !Lola is a beautiful puppy and so sweet! Very spirited! Thank you Don and Amy!!!! Dale and I appreciate you so very much! We are so unbelievably grateful to have found Mighty Michigan Bulldogges and the amazing breeders that are Don and Amy. From the beginning they made themselves available for any questions or concerns and not only became our friends but quickly our extended family. Don and Amy supported us through a tragic experience of which their kindness and generosity left us dumbfounded. We cannot express how blessed we feel to have met them and how proud we are to have one of their pups. Our baby Henry Mojo is a BEAUTY. We can’t go for a walk without being told what a handsome fellow we have. Everyone at the vet office loves him and even our vet can’t believe how beautiful and nicely he is growing. He is so smart and has a great personality!If you are looking for a top breeder who takes care and has a history of beautiful healthy pups you’ve found them at MMB. Don and Amy are not only knowledgable but take great pride in everything they produce. We are so happy with our pup and enjoy every minute with him. Thanks again Don and Amy! The roots of all goodness lie in the soil of appreciation for goodness. Dalai Lama On our journey to find our next pup we luckily crossed paths with Don & Amy. It had been a long road for us and we were feeling exhausted, having dealt with 2 different breeders for an extended amount of time. This breeding business is tricky and can change directions so quickly! So, there I was with this great hope still in my heart of getting the pup we were dreaming of. The first time I spoke with Don it seemed we had a connection. He wanted to know about my vision and truly cared. So fast forward >>> and we would soon be on a long journey with Mighty Michigan. This one is filled with saddness and pure joy. That’s right, pure joy. Sometimes we have to experience the saddness to truly appreciate what’s ahead. To sum it up, we stuck it out with Don & Amy and our dreams came true. As cheesy as that sounds, it’s the truth! Our beautiful Murray was born out of Spartacus and Maddie. We also aquired a real relationship with these 2 amazing people. And, I have my mentor! Our own kennel in the works and we are enjoying every step. If you are looking for a breeder and friend that adores their own dogs, and has good energy, you’ve absolutely come to the right place. We are the proud parents of Trixie Folcik from Mighty Michigan Bulldogges. We could not be happier with our girl!! We are so happy with all the care & love that Don and Amy have to our girl. You can just tell by the way she responds to us how well she was loved. Our girl has it all…beautiful coat, great structure and a disposition that melts your heart! Our Trixie is a cuddlier and lover! Don & Amy are more than a breeder…they are like family. They opened their home for us on several occasions. They answered all our questions and by letting us visit their pups and dogs they helped my son conquer his fear of dogs after being attacked a few years ago. We are forever grateful for that special gift. We are so happy & thankful for our blessing of Trixie. They are great people to work with and they LOVE every pup they have. Amy sheds tears when she is able to leave pups with their forever homes and Don is so gracious in his love for the breed and offer to help whenever possible. We love you guys and thanks for taking care of our girl. If you are considering a pup from Don & Amy you can’t go wrong. I have seen them with their dogs and they love each one unconditionally. Thanks again for our Trixie she is so special too us. MMB to simply put it they are HANDS DOWN the most efficient, responsible, knowledgeable breeders i have ever had the pleasure of meeting. i have read and researched many breeders for years and i can honestly say that we will NEVER purchase a dog from anyone else. i got a dog from a different breeder and when i picked my puppy i didnt feel like i had joined that breeders “family”. After talking with Don and Amy i felt like family and i have not even purchased my puppy yet! lol. Mighty Michigan Bulldogges should be the blueprint for ALL dog breeders. After much deliberation about local breeders, I chose Don and Amy at Mighty Michigan. Don was extremely personable during all phone calls and when I visited their house/property to meet Don, Amy and their dogs, in person, Amy handled my barrage of questioning like a pro! (which she is.) Mighty MI was more than happy to answer any/all questions by phone, email or inbox at any time of day/night. After the pups were born, I was invited to come to visit at any time! This is when I began to understand why the universe led me to these people. I learned that this litter of pups came with some incredible challenges, like having to be bottle fed, every 3 hours, because their mother was unable to nurse them. It was the love, dedication and tenacity Don and Amy had with this litter (and all of their dogs/pups!) that kept them alive and well. I’m forever grateful for my pup, Phoenix, and would recommend Mighty Michigan to all! The greatest decision I ever made was getting an Olde English Bulldogge from Mighty Michigan Bulldogges!! I can not stress it enough how wonderful they are! We called about 50+ breeders when we decided we wanted a puppy. We came across a lot of people you could tell only cared about one thing and it sure wasn’t the quality of their dogs. They simply told you price and expected date of availability. Right around the time I almost gave up hope I called one last breeder. I sure am glad I did! Don and Amy are truly terrific people. I could tell this just from our first conversation on the phone. They weren’t like any other breeders we had talked to. They were extremely informative, kind, you could tell they really cared and took pride in what they do! I knew they were the perfect breeders! They told me even before I put a deposit down for my puppy that they were there any time of day if I ever needed advice or was just excited that my puppy did something for the first time. They said if I wanted someone to be excited with me they would be! They proven this to be true time and time again! I can not tell you how many times from that day up until now (months late) that my puppy is here that they have been there for me already. From all my crazy questions about what toys to buy, to which size collar, to good books to read before he got here, to how to find a good vet they were there for me everytime! Not only were they there for me through every step of this exciting process but they kept me upto date on EVERYTHING! Constantly sending pictures and videos of my pup! This just shows you how much they care. It was so nice to knowing the entire time that Sullie was coming from a caring and extremely knowledgeable breeder who really knew what they were doing! I didnt have to worry about the quality of the dog I was going to get. I knew he would be an awesome dog! Now that Sullie has arrived officially I can say he was so much better than I could ever expected!!!! Sullie is not only an incredible looking puppy but he has the best temperament! He is such a sweet puppy! Most people say puppies are a terror. NOT in this case! Housebreaking and crate training have been a breeze! First night the most he cried was 2 minutes and now not at all. He even started after only three days to go into his crate all on his own just to hang out with his toys. He is one smart boy that is for sure! When we went to the vet for his overall health check after he arrived the vet said “where did he come from? He is one of the best looking olde english bulldogges I have ever seen! You can tell you really did your homework and he didn’t just come from anywhere” I couldn’t be more proud to say “he came from the worlds best breeders, Mighty Michigan Bulldogges!” I just want everyone to know how fabulous Don and Amy are as people and as breeders! I could not be more happy with my Olde English Bulldogge!!!! Thank you guys for everything!!! This was an awesome experience from the start because Don and Amy took a lot of time on the phone concerned about not only our needs and wants but making sure our new puppy Unzer was going to a good home. Leading up to his delivery, they constantly sent pics videos checked in on us and gave updates. I have no reservations in recommending MMB!Thank you for the new addition to our family! We could not be more thrilled with our puppy Kane (Smoke x Maddie born 4-22-13)! He is absolutely amazing! We get stopped on the street all the time by people wanting to know what kind of dog he is and where we got him. He is so loving and affectionate. Everyone that meet him instantly falls in love. When he’s not running around outside or playing tug of war, he’s laying right next to us on the couch. He has been a dream to train as well. Amy & Don are great and have been there every step of the way. If we have any questions, we really can call them 24/7. We are proud to be part of the Mighty Michigan Bulldogges Family and love having them and Kane part of ours! Mighty Michigan Bulldogges are like family they provide puppies that are of great quality and sound temperament. I have purchased two dogs from separate litters and I want more. My dogs love kids and are very protective of my family and if there are any concerns they provide excellent follow-up. Thanks Don and Amy! Don and Amy are amazing! We have called several breeders of all different kinds of breeds over the past year and they are by far the best people I’ve experienced. I really mean it. Some breeders you just call and they answer how much the puppy cost and when the litter is expected and then they rush off the phone leaving you to feel like you’re bothering them but with them it wasn’t like this at all! They not only answered all my questions but thoroughly took the time to go over every detail with me. They told me that even after I get my puppy that they are available 24/7 if I ever had any questions or even if I wanted someone to celebrate with about a new accomplishment in my pups life!!! I couldn’t believe how kind they were! It just shows how much Don and Amy not only take pride in their pups but truly care about them and their well being! Most breeders complete the transaction and feel they no longer have to care because to them its just that: a transaction. Leaving you on your own with figuring out all your questions. I can’t tell you how much I appreciate it that your not only there for the pup but for me too. Its very refreshing after coming across many breeders who like I said seem like your bothering them. I knew I wanted a pup from Mighty Michigan just based off the absolutely beautiful and handsome pups but given how great you guys have been just in the few short days since I first called I’m 100% sure I chose the right breeders! We couldn’t be more excited to get our handsome boy from Mighty Michigan Bulldogges in December! Thank you again guys!!! I don’t really know where to start! In May 2013 we started looking for a puppy and believed when we found Mighty Michigan bulldogs that the current litter they had was already sold. Upon contacting Don and Amy we learned that they actually had one female still available, they sent us pictures and with talking to them it took us only minutes to make our decision! Michonne has been a wonderful addition to our family and we get numerous compliments on her blue fawn color. We are not breeders but we know good people and good looking dogs when we see them! Don and Amy were there around the clock to answer any questions or concerns we had regarding michonne. Which being first time pet owners was a great comfort! Thank you again Don and Amy for giving us the opportunity to own a Mighty Michigan Bulldog and we can’t wait for the next one!! We could not be more pleased with our pup or our experience with Don and Amy! The level of personal interest they take in not only their dogs, but their potential puppy buyers impressed us from our very first inquiry. We truly feel like we became a part of a family with our Mighty Michigan pup! It is a pleasure to know Don and Amy, and it is just as much a pleasure to own our wonderful boy Rock Show! He is a beautiful joy for our family and we look forward to watching him grow! I am so pleased with Hallie the offspring of Harley & Mia I wanted to post again. Hallie is going on 2 years of age and is a social butterfly. At agility classes & games she is the hit of the party with other owners commenting they have never seen such a happy social dog. Even at the vet’s she gets special treatment. As she goes to work with me daily other tennats will stop by just to greet her. Currently Hallie is also working on becoming a therapy Dog. In short if you want a good looking, healthy dog with a great temperment you need look no further than Mighty Michigan. Harley is a good-looking boy! We are no longer breeding our dogges. We are pretty proud of the decendents of any of our dogges. RCK’s Asia was a pretty sweet girl. She produced some extraordinary puppies. We are so proud of Harley! You guys are doing a great job. Our Barley just had her first birthday. She is beautiful, smart, and very loving. She is exactly what we wanted in an Olde English Bulldogge. Amy and Don were wonderful to work with, and you could tell that the puppies were special to them. When people drive across country to safely deliver a puppy in the month of December, you know their sincere. Congratulations on your new web site Amy & Don. I am the proud owner of Hallie offspring of Harley and Mia. She has a kind and gentle temperament. She loves everybody. (Even cats…lol) We have been invited to train for agility competition. If you want a good looking, gentle temperament pup you are at the best breeder available. I purchased Lola the female brindle and I can not ask for a more beautiful, calm and intelligent puppy!! She is growing up to be everything they promised and more!! I will always come to the Mighty Michigan Bulldogges to purchase all my future dogs!! I went to there home and the loving and caring dedication to this breed shows in the quality of my puppy!! Thank You so much for being the honest and caring breeders you are!!! Congrats on going independent! I was somewhat suspicious about purchasing a top notch dog without actually seeing it first but Amy and Don were honest and reliable. I own Cow (he is on the “produced” page), I was amazed when I received my pup, pictures do not do their dogs true justice. He is amazing and at six months, he is protective and very loving towards his family. He is growing bigger and stronger daily and when he sees us his lower body sways back and forth, his tail wags, and he smiles! My advice to prospective buyers is that you will get a well priced, top notch dog who will win your heart instantly…thanks guys love ya!! New owner of Balto! I’m so happy and excited to spend years of my life with a great new friend. He is great, such a sweet and friendly puppy. Don and Amy were wonderful! I can totally tell why the puppy is so friendly after meeting Don and Amy. Thank you so much! We have Jasper. He fits in so well with my 3 crazy sons. He is wild and silly just like my boys. He is loved and we are so happy we found Amy and Don to bring him into our home!! We are so happy with our puppy. We couldn’t ask for more. He has become part of our family. Amy and Don are wonderful. When we have any questions they are there! Thanks!! !